Phoenice, Coelesyria, Decapolis, Iudaea, Herodiadarum tempore. 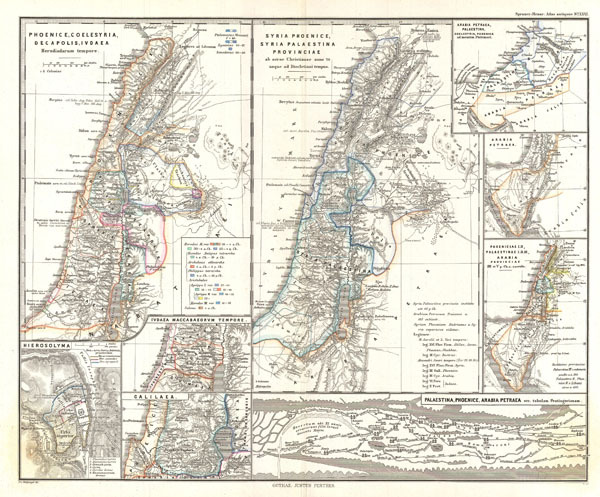 This is Karl von Spruner's 1865 map of the Holy Land, or Israel and Palestine. Essentially nine maps in one, Spruner features two dominant maps and 7 smaller insets, including a Peutinger Table in the lower-right quadrant. The Peutinger Map is an astoundingly important discovery and is today's only known example of a Roman world map, though the original Peutinger was itself a mediaeval copy of the Roman original. This map also shows, in counter-clock wise order from the Peutinger table, Galilaea, Hierosolyma, Judaea, Palestine at the time of Herod, Syria, Arabia, and Phoeniciae, Palestine, and Arabia. Many of the insets include their own scale or legend. Map notes important cities, rivers, mountain ranges and other minor topographical detail. Territories and countries outlined in color. The whole is rendered in finely engraved detail exhibiting throughout the fine craftsmanship of the Perthes firm. Spruner, Karl von, Spruner-Menke Atlas Antiquus,, (Gotha: Justus Perthes), 1865. Rumsey 1626.026. Phillips (atlases) 3288. Espenhorst, J., Petermann's Planet, p. 397-404. Espenhorst, J., Andree, Stieler, Meyer & Co., p. 148.